Who’s Interested in the Boston Marathon on Facebook? The Boston Marathon is underway. Despite temperatures expected to reach as high as 84 on this beautiful April day in Boston, 22,426 runners (84% of those who registered) took to the streets attempting to complete Boston’s famed marathon. In honor of Nanigans’ lone marathon runner, our SVP of Finance Scott Ward, we dove into our Facebook campaign data to find out who is interested in the Boston Marathon on Facebook. Breaking down the buzz around the Boston Marathon by age, it appears that people of all ages are interested in the event. 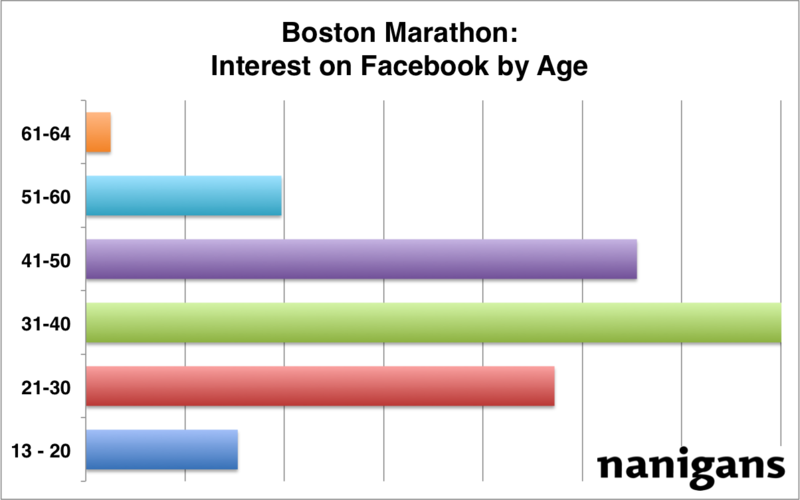 31-50 year olds dominate the interest, accounting for 60% of the total interest in the Marathon on Facebook. Ages 13-30 represent just over 30% of the total reach. Next we took a look at the gender composition of those interested in the Boston Marathon. Looking at the demographics below, it is evident that the Boston Marathon has captured the interest of both men and women. 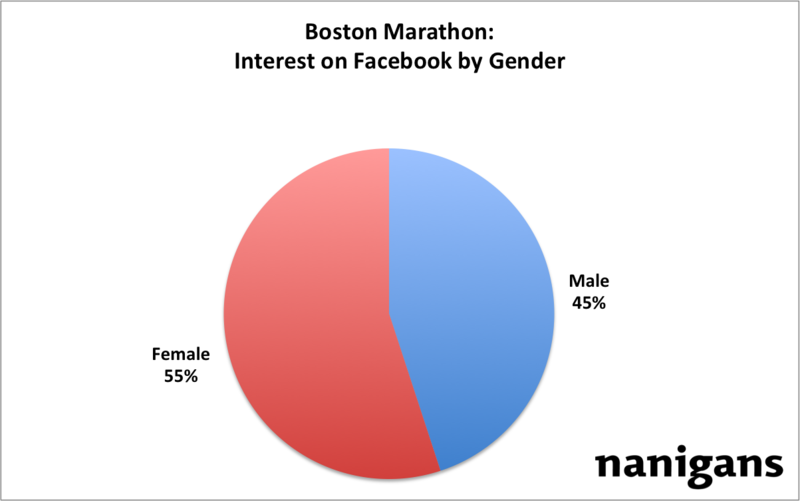 While women tend to be slightly more interested on Facebook, at 55% and 45% respectively, the Boston Marathon is clearly an event that spans genders. We then took a look at the 10 states with the most buzz around the Boston Marathon. As one of the most famous marathons in the world, there was buzz on the Boston Marathon across the nation. Not surprisingly, Massachusetts had the highest levels of interest, followed by California, New York, and Texas — perhaps due in part to their large state populations. Congratulations to Scott and the rest of the marathon runners today! Does anything surprise you in the data? Let us know in the comments!